Domino’s is one of the biggest take-away chains in the world. First founded in the United States, the Big D has since spread all over the world, with more than 8,000 locations worldwide. This popular pizza chain has reached markets that many other chains have failed to grasp. It has helped to create hundreds of thousands of jobs around the world and with steadily growing profits and a promising future, it has also kept its stock holders happy. What Time Does Domino’s Open? Domino’s hours differ from location to location, but they typically open at 11:00am. You can find more information on Domino’s store hours by looking for the relevant section at the bottom of this guide. What Time Does Domino’s Close? Most Domino’s locations will remain open for 12 hours, which means that they close at 11:00pm. As above though, this is not always the case and it depends on the location and the day. See the relevant section below to learn more about Domino’s store hours and delivery times, among other things. Tom Monaghan opened the first Domino’s Pizza restaurant with his brother, James, back in 1960. This was a small store and it was located near Eastern Michigan University, which allowed them to tap into the student market. They borrowed money to open this store and planned to split the working hours between them. However, James Monaghan wasn’t as committed to the idea as his brother Tom. He didn’t want to quit his job as a postman. Nor did he want to tire himself out by working two jobs. As a result, he sold his share of the restaurant to his brother and Tom went it alone. Tom had opened two more locations within the first five years as the brand grew steadily. The name Domino’s Pizza was first used in 1965, after which it stuck. From here, Domino’s Pizza grew, opening many more franchise locations in the United States. In 1983 they opened their first International store, in Canada. By this time they had 1,000 stores in total, and within a few short years this number had grown considerably. In this time the Domino’s Pizza name also expanded as far as Japan. They opened their 1,000th international location ten years later. Domino’s are still referred to as “Domino’s Pizza”. This was the name they used for many years, with customers simply shortening it to “Domino’s”. It was also the name they used on their iconic logo. However, they changed their name to just “Domino’s” in 2012. They also changed their logo to go along with it. They wanted to remind their customers that they’re not just about pizza, which is why they increased the amount of sides and non-pizza menu items at the same time. We try to be impartial here on Secret Menus. We’re not a review site and our goal is to showcase secret menu items and not to rate restaurants. However, there are some chains that we just love, some chains that are a joy to write about, and Domino’s is one of them. We love pizza as much as the next person (and the next person, and the next person) and for us, there is no better pizza chain than Domino’s. All pizzas are cooked using fresh dough, which is rolled, spun and topped right in front of your eyes. They use semolina when making this dough, which adds a slight sweetness and a delicious crunch to the base. All of their toppings are fresh and there is a huge selection of these to choose from. Domino’s can also stuff your curst with extra cheese or tomato sauce and they have a wide selection of sides to go along with your pizza. Some of the most popular of these include Dough Balls, which are sumptuous balls of dough containing melted cheese; Nachos, which are loaded with peppers and cheese; and Potato Wedges. All Domino’s pizzas also come with a creamy sauce, which is slotted right into the box for easy access. If this is not to taste, you can request a Honey and Mustard Sauce or a Barbecue Sauce instead. You can also create your own pizza on Domino’s, and this applies whether you’re ordering online, in-store or over the phone. You choose the toppings, you choose the size and the crust, and they make it fresh. The Domino’s secret menu is not unlike the Pizza Hut secret menu. In fact, the Hotdog Stuffed Crust (which is every bit as epic as it sounds) is available at both of these popular pizza restaurants. It seems that as soon as one of them comes up with an idea, the other either copies it or tries to go one better. And while they compete against each other, the customer can enjoy the benefits. 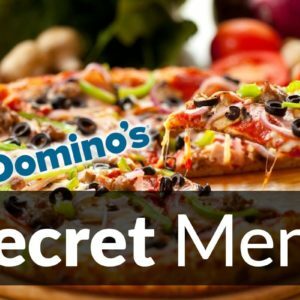 If you love pizza and all of the other delicious, greasy, cheesy foods that Domino’s offer, then this is one secret menu that you will definitely want to try for yourself. There are around 160 calories in a single slice of small Cheese Pizza from Domino’s. This is not bad, and it’s below what many people would predict. However, once you start adding extra cheese, meat and other toppings, this number grows. A medium slice of Pepperoni, for instance, comes in at close to 250 calories. In moderation, there is nothing wrong with Domino’s. But if you’re planning to tuck into a large pizza and sides, you should make room for more than 1,000 calories. To learn more about Domino’s nutrition info, read our guide on the subject. One of the things that sets Domino’s apart is their use of Meal Deals and their insistence on their customers taking advantage of them. It’s not always easy to follow these deals at a fast food restaurant, and for whatever reason, they get even more complicated with pizza restaurants. But Domino’s know this and do all they can to counteract it. More often than not, if you place your order the server will then punch the numbers and tell you if you qualify for a deal or not. You might get a reduced price, you might get some free sides or a bigger pizza. Either way, it’s all good. Domino’s menu prices are solid across the board, on par with what you would expect from other take-out pizza chains. There are usually cheaper options available, and non-chain pizzerias tend to undercut them on price. But such restaurants are notorious for selling low quality food, and most of the time it’s either undercooked or undercooked. With Domino’s, you get the best food time and time again, and if you don’t like it, if it arrives late or you’re just in a mood, you’re always one complaint away from a freebie or two. That’s the beauty of a big chain, and that’s the joy of Domino’s. Fast food chains don’t get a lot of respect and while there are always people queuing up to work there, it has more to do with the ease of applying and the decent wage than the fact that they are great places to work for. Domino’s is different though. Domino’s careers are actually worthwhile and the people who work here really seem to love what they do. Many people who own Domino’s franchises began by working at the chain. They made pizzas, they delivered pizzas, they managed and they supervised. They got a feel for the chain they developed a passion for it, and this led them to the franchise. Not only is it easier for people who work at the bottom to get into managerial roles, but it’s also easier for those who work as managers to get their own franchise. And because they have developed a certain understanding of the company and its customers, that franchise tends to perform better. So, take it from us, Domino’s is a great company to work for and if you can get in at one of their locations around the world then you should definitely go for it. With so many locations and so many roles needed you’ll find that there is usually always something on the go. Personally, we think it is better to work in the restaurant, as that will give you more of a taste of what Domino’s are about and it will help you more down the line, but take what you can get as we’re sure you will be happy with it. No. It is a fast food restaurant chain, and like all fast food chains, it is not interested in wasting money trying to dig into the recreational time of their employees. Also, they hire a lot of teenagers without qualifications and they are willing to give them a chance regardless, so drug testing would go against this and would create all kinds of problems for them, as well as for prospective employees. There are new Domino’s locations being opened all of the time. Many sites quote the figure as being 8,200, but this was the number in 2006, and it has grown since then. Domino’s uses a franchise model and it is licensed in many countries, sometimes under a name that is separate from the main brand. For instance, across India and a few other countries, the Master Franchise rights are actually owned by Jubilant FoodWorks, who also control Dunkin’ Donuts in India. So, while we can’t be sure of the exact figure, we can be sure it’s higher than 8,200. Many other chains that were first founded in the US have remained in the country and have opened the majority of their stores there. This is the case with everything from Subway to Taco Bell. But with Domino’s they have just as many international locations as US ones, although North America does edge ahead slightly in those stakes. Some countries where it is particularly popular include the United Kingdom, where there are new stores opening all of the time, from big cities to small towns; and Poland, where they have their own publicly listed company under the Domino’s brand. Domino’s is open most hours and you can order a pizza for breakfast, lunch and dinner if you want. The exact store hours will vary by location, but in most regions they open at 11:00am and close at 11:00pm. These times may be reduced on Sunday and during holidays. Is Domino’s Open on Christmas? Most Domino’s franchise locations are open on Christmas Eve and throughout the holidays. This applies to Christmas Day, for the most part anyway. However, it is important to note that they are franchises, which means they have some control over when they open and when they close. Is Domino’s Open on Thanksgiving? You can order Domino’s on Thanksgiving if you don’t get enough from your afternoon dinner and want a little more on the evening. However, as we mentioned above, many Domino’s franchises can do as they please, so not all of them are open during this holiday. The ones that are open only do so for a number of hours. To learn whether Domino’s is open on New Years, Easter and other holidays, read our guide on Restaurants Open on US Holidays.